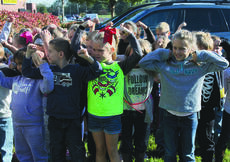 First grade students rang the literacy bell standing outside Grant County Public Library on Oct. 20 to let the world, or at least Grant County residents, know they learned how to read. In fact, each student had read at least one book in order to ring the bell. 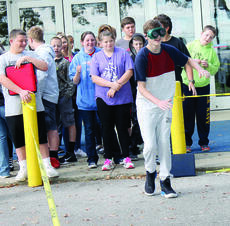 Students clapped, laughed and cheered on classmates as their respective names were called to tug the bell rope. Gov. Matt Bevin announced his solution to save the country’s worst-funded pension system Oct. 18. His plan protects current retirees’ benefits, ensures most benefits for current employees and restructures the system. For fall weather finally starting to appear, flu season also is here. Influenza is a serious disease that results in tens of thousands of deaths and hundreds of thousands of hospitalizations every year, according to the Northern Kentucky Health Department. 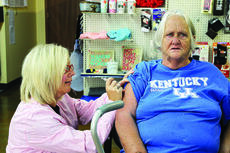 During the 2016-2017 flu season, more than 2,200 cases were reported in Northern Kentucky, and 14 deaths were attributed to complications from the flu. 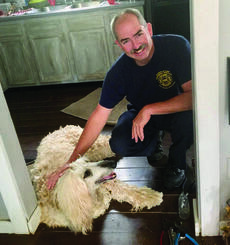 The Dry Ridge Fire Department had an unusual call Oct. 10 as a dog got his paw lodged in a vent and had been stuck for three hours before being freed. Jasper, an Afghan Hound, got a paw stuck in a brass air vent in the kitchen of Fran and Tim Slone’s Grantland Drive home. For three hours, the Slone’s struggled to free Jasper. “When Jasper would try to get up, he would howl the whole entire time in pain,” Fran Slone said. Firefighter Todd Anderson was able to use a bolt cutter to free Jasper. 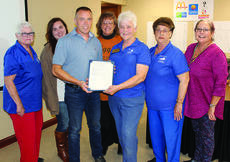 Dry Ridge City Council proclaimed Oct. 8-14 as Kentucky Homemaker Extension Week during their Oct. 16 meeting. Member Marleen McComas said they’ve been losing members each year due and recruiting has been difficult. 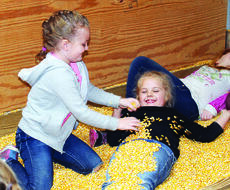 “We do a lot of things besides go to meetings,” said member Nelma Jean Huff. EYE IN THE SKY- Williamstown High School senior Harold Fernandez has been taking his photography talents to the sky by taking weekly aerial photos using a drone. Along with the photos, Fernandez posts a thought to go with the image. Get ready for Williamstown’s Fall Fest on Main on Friday, Oct. 20 from 6 p.m. to 9 p.m.
Fall means cooler weather, pumpkin-spiced everything and festivals, and festival organizer Bren Murphy encourages everyone to come downtown and have family-friendly fun during the festival. 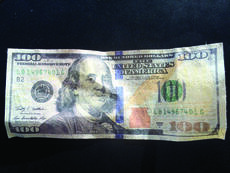 Two people have been scamming local businesses in Grant County with counterfeit $100 bills, according to police. Williamstown Police Department Sgt. Steve Cornman said about seven or eight “mom and pop” shops and yard sales have been duped with fake money around Oct. 4 and Oct. 5 in Williamstown and one yard sale in Corinth.